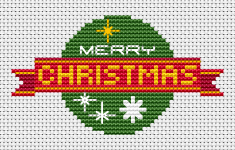 Free cross stitch pattern for making Christmas cards with the text: Merry Christmas.Contains Christmas symbols such as snowflakes, green ball ornament, red ribbon. Snowflake monochrome cross stitch pattern for dark blue fabric 14 ct.
Christmas card free cross stitch pattern.May this Christmas brings you love, joy and peace! Cute snowman holding a Christmas tree and waiting for Christmas to come. 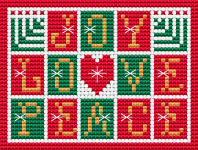 Beautiful Christmas decoration cross stitch pattern. Thrее colors are used for the back stitches - red,yellow and white. Candlestick with red Christmas candles and border.The pattern is designed for a green cloth, but it also looks good on dark blue. Small Christmas card cross stitch pattern for dark blue or red Aida with the text:MERRY.The chart is suitable for ornaments making also. Christmas or New Year's Eve cross stitch card with the childhood favorite character -happy Frosty waiting for cheerful holidays. 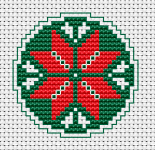 A small cross stitch pattern for various Christmas projects, such as: cards,tags, Christmas tree ornaments, small tablecloths and more. Red Christmas decoration cross stitch pattern with the text: "Bon Noel". Could be translated from French to "Good Christmas" or "Merry Christmas". Small Christmas card/tag cross stitch pattern for 14 ct dark blue fabric and the text:Merry Christmas.The chart contains full stitches,backstitch,3/4 stitches and few French Knots.